Libelium has been awarded with 2016 eHealth Awards in Boehringer Ingelheim category with MySignals IoT platform as the best initiative to improve worldwide health care. David Gascón, Libelium CTO, received the prize in the I National eHealth Spanish Congress that took place in Madrid on November 3 and 4. 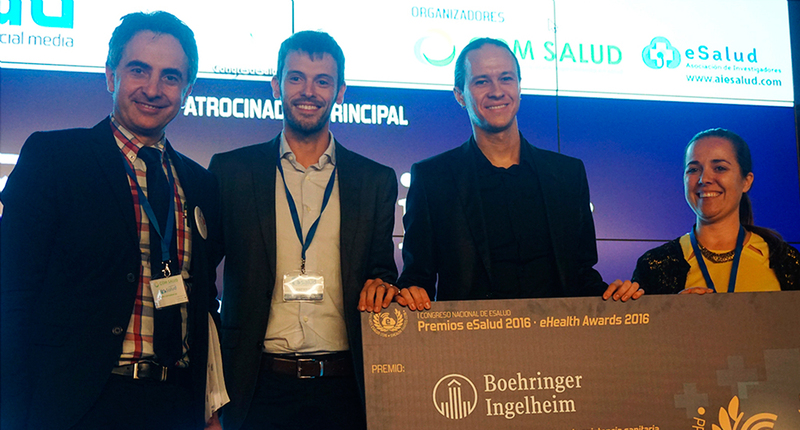 “Half of the world’s population lives in rural areas with very limited access to hospitals; this platform could enhance the potential of new IoT eHealth and medical applications”, stated David Gascón when he received the prize from the organisers. Libelium has released MySignals with the aim to improve the future of health services by covering one of the main challenges of the century: enhancing the universal accessibility to a healthcare system for more than 2 billion people worldwide. The revolutionary IoT platform works as a hospital monitoring room but fits in a small suitcase and costs one hundred times lower than an Emergency Observation Unit. “Until now, there was nothing in the market like MySignals, the perfect development tool for new medical devices and applications for quick prototyping and testing eHealth products”, pointed David Gascón. The eHealth IoT platform offers two different API’s for developers to access the information: the Android / iOS API using Bluetooth and the API Cloud to get the information previously stored and visualize it in a third party platform. The main aim of the I National eHealth Spanish Congress has been giving recognition and powering any kind of eHealth initiatives (apps, videogames or wearables) for medical patients and health professionals. During the conference, eHealth specialist discussed about the challenges, advantages and opportunities to adopt communication and information technologies in the healthcare environment. The event has been organised by the Research Association of eHealth (AIES) and the communication agency COM SALUD. Visit the offical website of MySignals to know all the details of the platform.